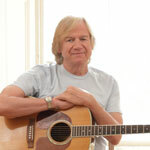 The Pullo Center at Penn State York welcomes Justin Hayward, Voice of The Moody Blues to its stage on Tuesday, October 28, 2014, at 7:30 p.m. Ticket prices are $55 and $40 and will go on sale August 8 at 10:00 a.m. Members can order now. Tickets can be purchased at The Pullo Center Box Office, charge by phone at 717-505-8900, or online at ThePulloCenter.com. In 1965 Justin answered an advertisement in “The Melody Maker” and found himself one-third of The Wilde Three with Marty Wilde and his wife Joyce, appearing on stage at the London Palladium in April of that year. He recorded two singles with The Wilde Three – JUST AS LONG/SINCE YOU’VE GONE and I CRIED/WELL WHO’S THAT – before branching out on his own and recording two solo singles in 1965/1966 – LONDON IS BEHIND ME/DAY MUST COME and I CAN’T FACE THE WORLD WITHOUT YOU/I’LL BE HERE TOMORROW. To this day, he credits Marty Wilde as having encouraged him to always write and sing his own material. Soon after the release of his solo singles, Justin answered another Melody Maker advertisement which led, in the Summer of 1966, to his letter and songs being passed on to Mike Pinder of The Moody Blues by Eric Burdon of The Animals, so beginning a famous and acclaimed 40-year career with the group, which started with the recording of Justin’s FLY ME HIGH as a Moody Blues single which was followed within a year by the release of his song NIGHTS IN WHITE SATIN. For more than 40 years, Justin Hayward performed and recorded with The Moody Blues, during which the group sold more than 60 million albums. Penning such timeless tunes as “Nights In White Satin,” “Tuesday Afternoon,” “The Voice,” and “Your Wildest Dreams,” Hayward’s songwriting was a driving force in the band’s success. He continues to thrill fans worldwide, and is recently completed a tour of the US.